To be a Christ-follower is to look foolish to the rest of the world. We tend to believe that this is a relatively modern thing. It is not. The earliest use of the name “Christian” was to derisively mock those who followed Jesus. And then, there’s this. This drawing is from a building in ancient Rome. It’s a form of anti-Christian graffiti. Many believe it’s the oldest depiction of the cross of Jesus known to humandkind. It dates from about the year 200, and was found on the walls of a building that once was part of Emperor Caligula’s palace complex. Look closely, and you can barely make out a figure beneath a crucifix looking up, and another figure on the cross. Quite clearly, a donkey-headed man. 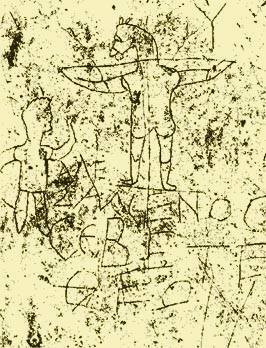 So, don’t miss the point: the earliest known depiction of the cross we have is a cartoonish drawing meant to be derisive. Even in the early years of Christian history, the idea of a God who would/could be crucified was ridiculous. Even St. Paul admitted that many saw it as a joke. So, the first point is this. Whether your feelings about Christianity are good, bad, or indifferent, if you’re under the impression that poking fun at Christianity is some relatively modern phenomenon –perhaps created by recent secular scientists or Bill Mahr(2)– you are sadly mistaken. What is true of our time, however, is that faith in God —whether it’s Christian faith or any other kind of faith— is derided by many as, at best, illogical. At worst, a mental disorder. To many outsiders looking in, it makes as much sense to worship a donkey-headed man as it does a crucified first-century Jew. The honest Christian understands this. The honest Christian does not get defensive or apologetic in the face of such accusations. Ultimately, they embrace the foolishness as Ultimate Truth. And yet, in a real way, we are still friends of Alexamenos. Proclaiming what seems crazy as what is Ultimate Truth. Before Christianity became co-opted by a Roman Empire desperate to survive, the first Christians understood the foolishness and proclaimed “Christ Is Risen!” anyway. We have so much light, all around us, these days, it’s hard for us to truly remember and realize what a problem total darkness can be. A few months back, I was reminded again about total darkness, when I went to Maria’s school, to see a production by her theater class. The theater classes at her high school were performing small dramas in the tiny black box theater. I know this will stun some of you, but I was running late. I came in the door, just after the lights had been taken down. I came through what looked like a small, normal classroom door. But just inside, it was totally disorienting. There was no light anywhere. I could not see even a foot in front of me. Then, stage lights came on, in the distance in front of me and I could make out that there were risers and seats in front of me. But it was still so dark that I couldn’t figure out how far away they were, whether there was anything between me and them, and where the steps were. So, I just stood there, paralyzed in the dark; wondering what, if anything was right next to me. Maybe you are feeling disoriented and in the dark? Maybe you have suffered the death of a loved one…or the loss of a job…or some other bit of pain and suffering. Maybe you are looking around you and you hear of tragedies like the ferry sinking in Korea. Or the troubling situation in Ukraine. Or the treatment of immigrants and LGBT persons in our country. And maybe sometimes it just seems like all you can see in your life is the darkness. If so, remember that this Easter morning story starts in darkness! There is one more facet to John’s resurrection story that captures me this year. It’s right after Mary realizes that Jesus is alive. She moves toward him, understandably, as if to hug him. Do not hold on to me. This, it seems to me, is important. To me, to really embrace the Easter message, we’ve got to, paradoxically, let go of Jesus. There’s a song from the movie Frozen which talks about this. “ Let It Go” is a song that’s sung over and over by children and youth today. And I think it’s because there is some deep spiritual truth to it. You can argue the physics and science of Jesus’ resurrection all day and, if you do, you’ll likely miss the point. To really understand the Easter message of resurrection, we’ve also got to let of our need for physical proof and to have everything explained and bundled up neatly and nicely. Ultimately, believing in resurrection means trusting in things that cannot be seen or explained. “I find that every time I try to hold on to life, I lose it. There is a constant giving up of what I have, even of what I treasure, if life is to remain vital. As soon as I try and hold on to an experience, or an understanding, or a security, life loses its spark. Depression increases, boredom grows, meaning erodes…. 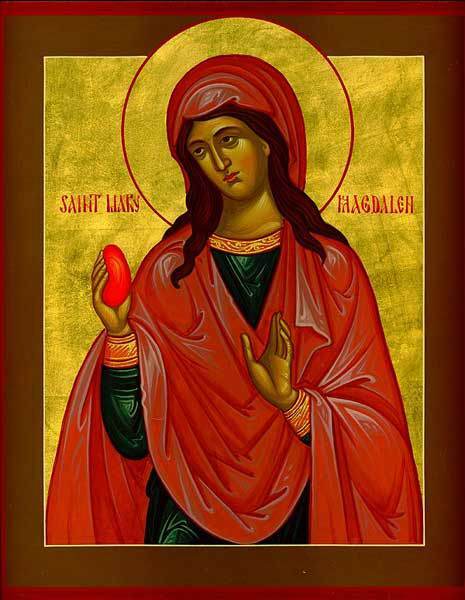 I could weep like Mary, there is great grief in letting go, and yet no life if I do not. Apostles do not stay still. They do not cling to just one view of Jesus. They trust that their view of God, and their view of resurrection will grow and change overtime, as God reveals Godself to them. When we let go, perhaps we can again embrace the metaphor of the crucifixion and resurrection. Whether you see the metaphor of a crucified and risen savior as Ultimate Truth, whether you are a sceptic, or even if you think it’s as crazy as worshipping a donkey-headed man, spend a moment today meditating on the truth of resurrection itself. Consider how all of nature, this time of year, speaks to the truth of life overcoming death. Trees and flowers scream-out the truth that live overcomes death. That death is not the final word. Each beautiful dawn reminds us how light overcomes darkness. That darkness is not the final word. I don’t happen to believe that Jesus’ death was “necessary” for God’s story. God did not send Jesus intentionally to be crucified. (3) But rather, I believe that resurrection is baked-in to the very fabric of the universe. God takes whatever bad things happen in our world and makes new life out of them. That how “the reality of reality” works. Death does not happen so that there can be new life. New life comes out of death just as surely as the Sun rises in the East. That’s the message of Easter. To say “Christ is Risen” means that we let go enough of our own understanding so that the truth of the message can live in us. Even today, even with all the centuries that have passed and the horrors that the Church itself has committed, the basic Gospel story itself is still counter-cultural, in every generation. It’s baked-in to the fabric of all existence, not just in this Gospel lesson today. (2) I love Bill Mahr, except for this gaping blindspot he has about religion in human life. And, I’m grateful that even some of his atheist friends confront him about it. (3) Because I believe strongly in the Trinity, I do not believe God is suicidal, and therefore reject many atonement theologies. You can read more here.